PNY has released the perfect storage device for users who are looking for flash drive with an elegant and long lasting design, the HP v232w USB 2.0 flash drive. With high-quality metal outer casing and a slim, streamlined outline, this pocket-sized pen drive can store massive amount of personal data, movies, images, music in its 64GB memory space, while comfortably fitting inside your back pocket or wallet. 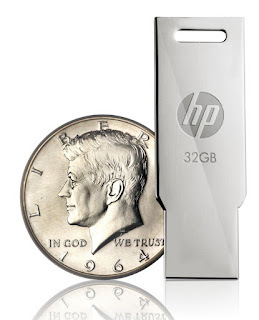 The HP v232w connects easily with your laptop or PC thanks to its simple plug-and-play operation making it the ideal portable flash drive for transferring and sharing all your files during business meetings or while working on school assignments.Despite its small size, the HP v232w has a robust body with metal finish that protects it against scratches to ensure the drive retain its shiny and sleek appearance. PNY utilizes anti-fake electronic plating after printing technic to all its flash drives to prevent counterfeiting, so users can easily distinguish between genuine PNY products against fake counterparts.The HP v232w features this advanced technology with original HP logo imprint in its body. To enhance its portability, the drive features a lidless design with an integrated wide strap hole that can be attached to keyrings, mobile straps or handbags.The HP v232w has a universal USB 2.0 connector, which makes it compatible with all USB ports that are of version 2.0 or lower. The pen drive will read data at a minimum speed of 14 Mb/s and will write data at 4 Mb/s. The drive is also available in 8GB, 16GB, 34GB and 64GB variants of memory space depending on your storage needs. Moreover, it is compatible with Windows XP/2000, Windows Vista, Windows 7, 8, 10 and Mac OS 10:3 and above, backed with PNY’s limited warranty of 2 years.